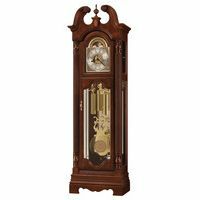 The clock is housed in a large case, which is 16.5 inches tall, 12 inches wide and an unusual 9.5 inches in depth. It is a mahogany case with fruit wood inlay. Most of the finish is original, with the exception of some restoration done to the veneer on the top right side of the case (see photos). 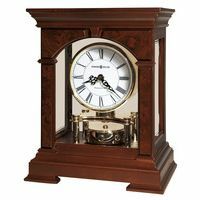 The clock weighs in at a very impressive and heavy 22lbs.The arched top of the beautiful silvered dial has three subsidiary dials. The First one controls the speed of the clock. The Second one will silence the chime if so desired. The Third Subsidiary Dial is used to select the chime tune -- the four gong melody plays the famous Westminster Chime, and the eight gong melody plays the somewhat less well known but very beautiful Whittingham Chimes, which plays on eight gongs. On each hour, the 9th gong strikes the number of times to reflect the number of hours.The clock plays music every 15 minutes, playing progressively more on each quarter hour, until the full chime is played on each hour (and the 9th gong struck repetitively to signify the relevant hour). 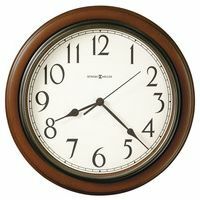 The clock is a REPEATER, and the repeat pull string has been replaced recently, and works as it should.